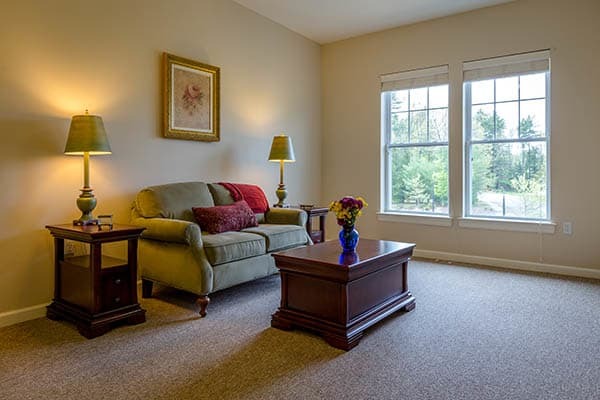 Bentley Commons independent living is a centrally located senior living community in Bedford, NH. For those looking for independent senior living, our attractive apartments offer an ideal lifestyle. Independent living at Bentley Commons provides the convenience of services and amenities including restaurant-style meals, a changing calendar of planned activities, outings, and housekeeping, and the peace of mind that comes from knowing everything will be take care of. Independent Living at Bentley Commons at Bedford offers residents the opportunity to be as active as they can and want to be. And, aside from organized activities, our community has various community rooms where residents can do what they want when they want. Whether it’s a lifelong passion or a new skill, our residents will have diverse and constant opportunities to engage with others, enjoy themselves, and continue to grow as a person. Lecture series and workshops through our lifelong learning program, book clubs, discussions around current events on both a local and national level. Walking groups, tai chi, chair yoga, low impact aerobics, strength training, gardening. Religious services, bible study, discussion groups, meditation. Parties, seasonal events, movies, bridge, bingo, group word games, trivia nights. Local restaurants, grocery and retail stores, attractions, community events. As part of our commitment to offering innovative, fun and educational programs at Bentley Commons at Bedford, the Frequent Flyer Loyalty Program was created. With loyalty cards for each resident and awards at the end of each month for those with the most participation, our program encourages engagement and rewards participation. Programs ranging from guest lecture series, artist instruction, book clubs and more are part of the monthly offerings. Dining is an essential part of life and health. At Bentley Commons, we understand that food is not only necessary for nutrition; it is also an important opportunity for regular and ongoing social engagement. Our gourmet dining program offers meals that are home-cooked for flavor and served restaurant-style for comfort and convenience. Our professional wait staff takes care of everything, enabling our residents to enjoy healthy, delicious, and relaxing meals with their neighbors. Dietary restrictions are carefully monitored to ensure our meals bring only delight. While daily menus—following nutritional guidelines—are set in advance, we can tailor our menus to meet most specific dietary requirements. If a resident isn’t feeling well or prefers to have meals in bed, room service is available. At Bentley Commons at Bedford, there is more to independent living at than just the gourmet dining experience, extensive activity program, and engaging outings. Our goal is to exceed resident expectations whenever possible by offering a wide range of services and amenities—and we are always looking for ways to make the experience better for our residents.